United Airlines will NOT accept carriers that are NOT bolted together. UK airlines are fine but check your Airline kennel travel requirements first. This worked out a costly expense. kennels are fine have had no problems with them. Check the small print, perhaps it should be within the titles and not at the bottom. ~ This kennel it's just what IATA regulations ask for pets travel completely safe and comfort because the pets should stand up inside and move without restrictions...(never with 2 pets inside) It's a kennel for CARGO (air plane, train, car) - not for the owner feel in comfort to carry or show off as vanity accessory. It is made of solid materials and looks nice. I use this as a base in my rabbit's shed and it's brilliant. They love hiding in it and they have enough room to lie stretched out. It fits in my car too and its great for taking both of them to the vets as I can just wheel them behind me through the vets. Brilliant. We are diplomats who travel with a full house of dogs and cats, changing posts every 2-4 years. 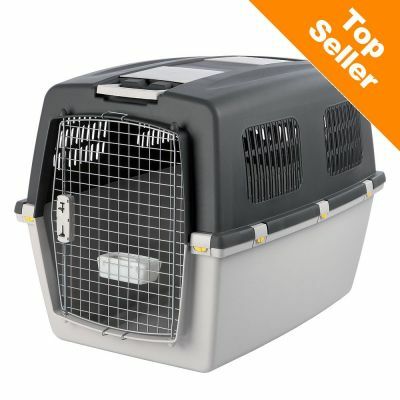 After trying many brands and types of travel crates, we have settled on Kennel Gulliver: easy to assemble, sturdy, secure, open enough for air circulation, closed enough to allow the animals a sense of security. And it bears up well to the rough handling that baggage personnel can sometimes inflict. My only suggestion for improvement would be that all sizes, not just the 70, come with the wonderful removable floor that separates the dog or cat from any urinary accidents. Until then, be sure to get puppy pads for the smaller siezes. Bought this for my beagle pup. Knew it would be too big for her to start with but have been able to fill the back to make it smaller to use for toilet training. Was delivered promptly, was easy to assemble and the handle is a bonus (although i didn't think to purchase the wheels so am currently just dragging it aross the carpet!) Haven't used the water bowl as am still toilet training. This is half the price of crates i have seen in pet shops and appears no different. I would recommend it.